In common with any company offering holidays or services, we are obliged to have a page of “small print”. Some of these paragraphs are for your own protection, and some are for ours. Please read through our Terms & Conditions carefully and be aware of the security implications and benefits they may offer you, and also how you may become contractually obliged should you decide to book one of our tours. We look forward to welcoming you to Oxford. If you wish to arrange a tour with Explore Oxford Tours, it is best to Contact us first, either by telephone or by using the form here on the website, to ensure that we are operating tours on the dates you plan on joining us. We can then discuss your specific requirements, timing, number of people, payment options, cancellation insurance, and other details. Following discussion of your requirements, we will send you an acknowledgement, outlining the tour details we have discussed and payment terms, and issue you with a Booking Reference. Having established that your preferred dates are available, you can then complete your booking by using our online Making a Booking page, or downloading and completing the PDF Booking Form which you can then post to us, together with your payment. We will issue a further acknowledgement, confirming receipt. Please note that the second of these links is to a file in PDF format. You will need to download the file, print it out, and complete it. The easiest way to do this may be to “right click” on the link above (or repeated below) and select “Save link as” from the pop-up menu. Save the file to your hard drive, from where you can open in Acrobat Reader and print out a copy. Alternatively, “left click”, view the file, and print out directly from the screen. If you are planning well ahead, we can accept a deposit instead of full payment for your tour. The deadline for this is 14 days prior to the due date for your tour. If you are using our PDF Booking Form, then please return that to us with a deposit amounting to £25 – if booking more than 14 days before the due date of your Tour. On receipt of your deposit, we will send you a confirmation invoice for the balance, which must reach us at least two full weeks (14 days) before the date of your tour. If for any reason it proves impossible to confirm your tour dates or times, no deposit is taken. If you are paying your deposit using our on-line Making a Booking page, then be sure to select “Deposit” from the range of options, but only if you are completing your reservation more than 14 days before the due date for your tour. If you will be taking the tour within the next 14 days, then you will need to pay in full. Please send a cheque payable to “Explore Oxford Tours Ltd” for the full amount due with your booking form. Cheques must be in Pounds Sterling and drawn on a British bank. Please complete the online Making a Booking page and submit it to us here at Explore Oxford Tours. This works through PayPal, so please click This Link for additional information about PayPal and using a PayPal account. This should be in Pounds Sterling, and can be purchased from most Post Offices. Please note that you will have to cover all the costs and bank charges. If you wish to use this method, please Contact us in order to confirm bank details etc. Once the booking for the tour has been processed and the guides commissioned you will be sent a confirmation of the tour by e-mail. Receipts will be sent only on request. Agents – please ensure you send a copy of these Terms and Conditions and the Booking Form to your group leaders. If you need to make alterations to the details of your booking, we will do everything we can to help. Cancellation or amendments to the booking must be made in writing at least 5 working days before the tour. When a booking is cancelled a Cancellation Fee of £25 will be charged, or the deposit shall be forfeit. If less than 5 days notice is given when cancelling a tour or a guide booked for a tour, or if the group fails to arrive, the total amount of the tour fee will be retained to pay the guide(s). In the case of a change of date and/or time a £15 fee will be charged. If on the day of the tour the group size differs from that stated on the booking form and it is more than 19 people or a multiple of 19, the guide(s) will not take the additional tour delegates. These cancellation charges are implemented in all cases. We recommend that you are fully covered by a comprehensive travel insurance policy. A group arriving late for a tour will have that time deducted from their tour. Guides will wait at the meeting point for 1 hour. No refunds will be given for late arrivals. Group leaders will be given the mobile telephone number of the guide. In the case of a delay, groups must make every effort to contact the guide on the number given or the offices of Explore Oxford Tours Ltd. Explore Oxford Tours Ltd accepts no responsibility for accidents occurring during the course of a walking tour. 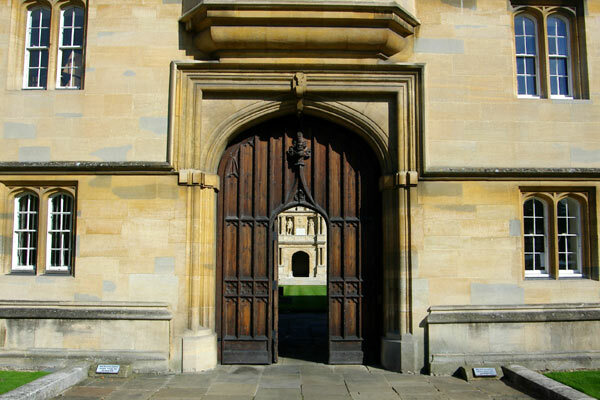 All Explore Oxford Tours Ltd guides are members of the Oxford Guild of Guides and hold the guiding qualifications of the Institute of Tourist Guiding in London. All guides are covered by Public Liability Insurance. Although every effort will be made to find foreign language speaking guides, this may not always be possible. Explore Oxford Tours Ltd will arrange for English speaking guides instead. If you have specified on your booking form that this is not acceptable, the tour will be cancelled. We welcome bookings from schools and educational establishments, and will be happy to tailor a tour to the specific needs of pupils and students. When making a booking, schools and colleges should nominate a leader who will be responsible for the group, with at least one adult member of staff accompanying every ten pupils or part number thereof. They should also inform us of the age range of the students and, where applicable, the sphere of interest or course being studied. Please provide this information at the time of making a booking. We recommend a 1.5 hour tour for school groups. Guides can be booked to match the English level of the Group: Beginners or Intermediate. Please specify the level required on the PDF Booking Form. We recommend a 1.5 hour tour for Beginners. Each group leader counts as one person and there are no free places on tours and no price reduction for children. Large groups of young people must be accompanied by a group leader on their tour – at least one group leader per 18 students. One guide will be allocated to every 19 people. In addition, Explore Oxford Tours Limited is protected by a series of standard “Force Majeure” clauses relating to rare instances where, due to circumstances beyond our immediate control, we may be forced to make changes to a tour, or even cancel a booking. If you would like to receive a copy of these, please Contact us. We want our guests to enjoy their tour, and tell others of their experience with Explore Oxford. We rarely get complaints, but if you do have any concerns about your tour or the service you’ve received, then please tell the guide straight away. They will make every effort to resolve the problem immediately. In the event that a complaint cannot be resolved on the day, then please write to us as soon as possible. We welcome comments and suggestions. If you have a good idea about ways in which you think our tour could be improved, please let us know! If you enjoy the tour, then tell the world. We have a very active page on TripAdvisor, as well as pages on Facebook and Twitter. It will be wonderful to meet you there! We are firmly committed to respecting the privacy of our clients. If you are on our mailing list you will only receive communications from us that we believe are relevant to your interests, such as new tours or special offers, and you can remove yourself at any time from our list either by writing to us (see our Contact us page for full details) or by sending a blank email with “Unsubscribe Mailing List” in the subject line. This website employs ‘cookies’ (see below ) for two reasons. Firstly, to allow us to monitor general non-specific statistics relating to traffic visiting the site, and secondly, to enable our clients to access their own records of bookings and reservations if they have registered with us – in most cases this is not necessary. We never check or examine cookies individually. Analytical cookies allow us to monitor some very general statistics about the website and the traffic that visits it. Using Google Analytics and other similar webmaster tools, we can assess the volume of visitors to the site, as well as where visitors are coming from, the links they have used to reach the site, keywords they may have used in search engines, and so forth. We do not have the facility to make any further use of the information that these generic cookies may contain, and they are, at all times, anonymous. If you place a booking with us, the details you submit will be placed securely in our database. Those details allow us to process your booking quickly and efficiently, and without this mechanism, it would be difficult for us to offer the kind of service of which we are very proud. It would also be impossible for us to offer an on-line booking facility. In addition, these details will always remain accessible to you if you have registered an on-line account with us, allowing you to log in at any time to check the details of your booking. Changing your browser settings to decline cookies will enable you to opt out of the anonymous analytical data collection, should you wish to do so, but it may also restrict the level of service that we can offer to you, as a guest on one of our tours. This website includes some links to third-party websites, plug-ins and applications. Clicking on those links or enabling those connections may allow third parties to collect or share data about you. We have no control over these third-party websites and are not responsible for their privacy statements. When you leave our website, we encourage you to read the privacy notice of every website you visit. A cookie is a small text file placed on your hard drive by a web page server. They are usually stored in a folder entitled “Temporary Internet Files”. Where this folder is sited on your computer’s hard drive will depend upon the operating system you use. Please note that cookies cannot be used to run programs or deliver viruses. They do not contain information that can be used to identify you personally. Cookies simply enable website managers to track visitor numbers and routes through their web sites. Most web browsers automatically accept cookies, but you can opt out by changing your browser settings. If using Windows, please check your Internet Options dialogue via Control Panel, or under the “Tools” drop-down menu in Internet Explorer. In Google Chrome, the cookie control facility can be found under the “Options” dialogue within the wrench drop-down menu. Access in Firefox is via Tools/Options/Privacy. The information given on this website has been carefully checked and we believe that it is correct at the time of writing. However, we reserve the right to make alterations and improvements to the tours that we offer. In addition, we cannot be held responsible for changes implemented by third parties, either to prices or details of attractions and services. This website has been created and published in good faith, and in the belief that references, prices and content is factually accurate. If you discover errors, or you have additional relevant information that you feel might be of use to us, or to other visitors to this site, please let us know. We are always happy to develop and improve the content of the website. If you encounter any problems with the website, such as broken links or problems with functionality, please contact our webmaster. This Privacy Statement provides you with details of how we collect and process your personal data through your use of our site at Explore Oxford Tours (www.exploreoxfordtours.com). Isobel and David Lewis, Proprietors of the Business, are the Data Controllers and are responsible for your personal data (referred to as “we”, “us” or “our” in this privacy notice).If you have any questions about this Privacy Notice, please Contact us through this website, or you can telephone us using any of the numbers on our Contact page. It is important to you, and to us, that the information we hold about you is accurate and up to date. Please let us know if at any time your personal information changes by emailing us. • Communication Data. This includes any communication that you send to us whether that be through the Contact page on our website, through email, text, social media messaging, social media posting or any other communication that you send us. We process this data for the purposes of communicating with you, for record keeping and for the establishment, pursuance or defence of legal claims. Our lawful ground for this processing is our Legitimate Interests, which in this case are to reply to communications sent to us, to keep records and to establish, pursue or defend legal claims. • Customer Data. Thgis includes data relating to any purchases of services from Explore Oxford Tours, such as a tour booking. This may include your name, title, billing address, delivery address email address, phone number, contact details, purchase details and your card details. We process this data to supply the goods and/or services that you have purchased and to keep records of such transactions. Our lawful ground for this processing is the performance of a contract between you and us and/or taking steps at your request to enter into such a contract. • User Data. This includes data, typically stored as Cookies, which record how you use our website and the online services we provide. We process this data to operate our website and ensure relevant content is provided to you, to ensure the security of our website, to maintain back-ups of our website and/or databases and to enable publication and administration of our website, other online services and business. Our lawful ground for this processing is our Legitimate Interests which, in this case, are to enable us to administer our website and our business properly. • Technical Data. This includes data, typically stored as Cookies, about your use of our website and online services such as your IP address, your login data (if you have an on-line account with us), details about your browser, length of visit to pages on our website, page views and navigation paths, details about the number of times you use our website, time zone settings and other technology on the devices you use to access our website. The source of this data is from our analytics tracking system. We process this data to analyse use of our website and other online services, to administer and protect our business and website, to deliver relevant content to you and to understand the effectiveness of our advertising. Our lawful ground for this processing is our Legitimate Interests, which in this case are to enable us to administer our website and our business correctly and efficiently, and to grow our business and to decide our marketing strategy. • Sensitive Data. We do not collect any Sensitive Data about you. Sensitive data refers to data that includes details about your race or ethnicity, religious or philosophical beliefs, sexual orientation, political opinions, trade union membership, information about your health and genetic and biometric data. We do not collect any information about criminal convictions and offences. Where we are required to collect personal data by law, or under the terms of the contract between us, and you do not provide us with that data requested, we may not be able to perform the contract (for example, to deliver goods or services to you). If you don’t provide us with the requested data, we may have to cancel a product or service you have ordered but if we do, we will notify you at the time. We will only use your personal data for the purpose for which it was collected, or for a reasonably compatible purpose if necessary. For more information on this please Contact us. In case we need to use your details for an unrelated new purpose we will let you know and explain the legal grounds for processing. We will only process your personal data without your knowledge or consent where this is required by law. We may receive data from third parties such as analytics providers, including Google, based outside the EU, advertising networks such as Facebook based outside the EU, search information providers such as Google based outside the EU, providers of technical, payment and delivery services, such as data brokers or aggregators. • Other companies who provide services to us and facilitiate our provision of our services to you. This may, for example, include booking or travel agencies, third parties offering elements to a tour (such as private colleges we may visit or other attractions), hotels and tourist information bodies. • Professional advisers including lawyers, bankers, auditors and insurers. • Government bodies that may require us to report processing activities. We require all third parties to whom we transfer your data to respect the security of your personal data and to treat it in accordance with the law. We only allow such third parties to process your personal data for specified purposes and in accordance with our instructions. We would not transfer your personal data outside the European Economic Area. We will only retain your personal data for as long as necessary to fulfil the purposes we collected it for, including for the purposes of satisfying any legal, accounting, or reporting requirements. When deciding what is the correct period for keeping the data, we look at its amount, nature and sensitivity, potential risk of harm from unauthorised use or disclosure, the processing purposes, if these can be achieved by other means and legal requirements. For tax purposes the law requires us to keep basic information about our customers (including Contact, Identity, Financial and Transaction Data) for six years after they stop being customers. In some circumstances we may anonymise your personal data for research or statistical purposes in which case we may use this information indefinitely without further notice to you. Under data protection laws you have rights in relation to your personal data that include the right to request access, correction, erasure, restriction, transfer, to object to processing, to portability of data and (where the lawful ground of processing is consent) to withdraw consent. You can find out more about these rights on the ICO website. If you wish to exercise any of the rights set out above, please email us. You will not have to pay a fee to access your personal data (or to exercise any of the other rights). However, we may charge a reasonable fee if your request is clearly unfounded, repetitive or excessive or refuse to comply with your request in these circumstances. This website is in the public domain. You are therefore granted personal, non-transferable and non-exclusive access to read and reference the content of this website for your own personal use. However, you are reminded that all intellectual property rights, whatever their form, are copyright Explore Oxford Tours or by the photographers and copywriters who have worked with us to create the site. The dissemination and use of that material within a context outside your own personal use may contravene copyright laws and could result in legal action. This is particularly so in relation to this site’s photographic and textual content. No part of this website may be reproduced or stored in any other website or included in any public or private electronic retrieval system or service without our prior written permission. If you wish to use content sourced from this website, please feel free to Contact us for advice. If you would like permission to use any image from this site for editorial purposes, or to request high resolution versions of the images featured here, please Contact us . The use of this website and the content is at your own risk and we cannot be held liable or responsible for any matters arising therefrom. This website contains links to other sites. We cannot assume responsibility for the accuracy or appropriateness of the information, data, opinions, advice, or statements contained within these sites, and when you access such sites, you are doing so at your own risk. In providing links to these other sites, we are in no way acting as a publisher or disseminator of the material contained thereon and we do not monitor or control such sites. A link to another site should not be construed to mean that we are affiliated or associated with the site, and we do not recommend or endorse any of its content, including without limitation any hyper-links to or content found, on the other web site. The mention of another party or its product or service on this web site should not be construed as an endorsement of that party or its product or service.